I’ve long said that if I had to choose one scent and be able to smell only that for the rest of my life (who’s making me choose? why? don’t think about it that hard), I think it might be fresh basil. Fresh basil is one of the BEST smells in the world! As I mentioned back in my tiramisu post a few months ago, I studied in Italy during college on a language immersion program, and I lived with this awesome couple named Pietro and Giovanna. Giovanna was an amazing cook and made us three- and four-course dinners every night, and also imparted a few of her family’s recipes to me. This and the tiramisu are the two that have become a permanent part of my recipe book. I make this every week or two during the summer when fresh basil is plentiful and high-quality. It’s my #1 go-to recipe because it literally takes 15 minutes from start to finish. Basically, as long as it takes to boil pasta, that’s how long this dish takes. As you’ll notice in the pictures below, I’m actually showing you pictures from two different times I made this dish (don’t be confused! ), because there are two ways you can do it—the real way, and a slightly modified way with fewer ingredients. Both are really easy, it just depends on if you want to go to the trouble of buying two extra things. First, I’m going to show you the weird secret to the best pasta con pesto. That’s right—green beans and tiny red potatoes. I know, I know, you think I’m insane and you’ve never had a pesto pasta with beans and potatoes in it, and this is my inner Midwesterner showing. But Giovanna swore by adding a little bit of green beans and diced red potatoes to the pasta, because it gives it “struttura”—texture. And it does, and it’s absolutely delicious. The green beans add a crunch and the potatoes have a softness that complement the chewiness of the al dente pasta. I’ll be honest and say that I rarely make it this way because I always forget to buy them, but I want you, my dear readers, to know the absolute best of everything. Trust me on this one. So to start, set a pot of water to boil. Once it’s boiling, throw a small handful of salt in along with the pasta you’re using. Many different kinds of pasta work well with pesto, but I often go with fusili (rotini) pasta, or sometimes orichette (literally “little ears”) when I’m feeling feisty. I found these fun “gigli” ones at Kroger that I tried. Anything that’s kind of twisty works well, it grips the sauce nicely. Cook the pasta according to the directions but make sure to leave it al dente, don’t overcook. In my opinion, few food sins are worse than overcooked pasta. If you’re using the potatoes and beans, throw the potatoes in there pretty much right away, then a few minutes into the pasta cooking add the green beans (you don’t want the green beans to cook much). While the pasta’s cooking, we make the pesto. Fresh garlic is always the best. If you can swing it, use fresh garlic cloves instead of pre-minced stuff from jars. You’ll also get much, much more of the health benefits from fresh garlic—it begins losing a lot of those benefits within an hour or so of being minced. Throw the basil leaves, the minced garlic, a hefty handful or two of pine nuts, sea salt, grated parmesan cheese, and around 1/4 cup of olive oil in a small food processor. Blend until it forms a beautiful, fragrant paste. If it seems too thick, you can add more olive oil to thin it out. It might be different every time you make it, just depending on your mood—sometimes you may want it a little chunkier and sometimes very smooth. In a large bowl, put a tablespoon or two of butter, cut into pieces. 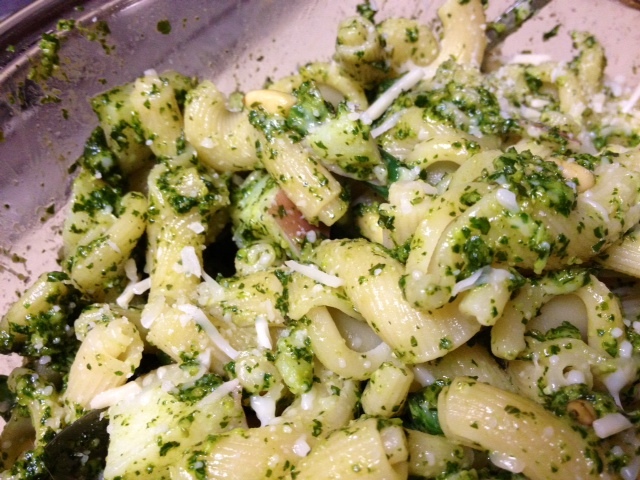 Pour the pesto in the bowl, and throw in some more whole pine nuts and grated parmesan. When your pasta is al dente, drain it. You want your pesto to already be done, so you can toss immediately—this melts the butter and helps spread the pesto out over the pasta without things sticking. Pour the cooked pasta (and potatoes and beans) into the bowl and toss everything together so the pasta gets a good coating of pesto. The butter will melt so it helps this process along. Serve piping hot, alone or with crusty Italian bread. It’s great leftover as well, but never as good as when it’s fresh. You can see a tiny peek of potato in this one. This is seriously my all-time favorite dish. It always takes me back to Italy and Giovanna puttering around in the kitchen, adding some stock to the risotto and showing us how soak and pat the eggplant before breading it. Even just the scent takes me there! Boil water for the pasta, and add a handful of table salt when it’s boiling, then add the pasta. If you’re using the beans/potato, add the diced potato to the water with the pasta, then add the green beans after a few minutes. Cook until al dente, then drain. While the pasta is cooking, throw the basil, olive oil, garlic, and most of the pine nuts, cheese, and salt into a small food processor. Blend until it’s the consistency you want, adding more olive oil if necessary. In a large bowl, put a tablespoon or two of butter, a little more Parmesan and pine nuts (and maybe a tiny bit more salt) and add the pesto. Once you drain the pasta, add to the bowl right away and toss immediately, making sure everything gets a good coating of pesto. Serve hot, and you can store for several days in airtight containers in the fridge. I’ve never tried it with purple basil (a little hard to come by), but as far as I know it would be just as good–if not better!